Is EasySolar app going to boost residential PV? During 2013 there was over 37 GW of installed photovoltaic systems worldwide (EPIA). Those figures exceeded earlier predictions and show that the technology of photovoltaics is still developing and will have a significant potential to grow much even more thanks to market-driven cost reductions and revolutionary module and inverter technology advancements. The development in recent years included all segments: from residential to commercial and industrial systems as well as large ground-mounted solar farms. Systems that are however most difficult to sell are usually residential projects. Small-scale systems usually apply more time spent with individual customers. Now preparing conceptual designs and professional offers will become a piece of cake for small-scalesystems. 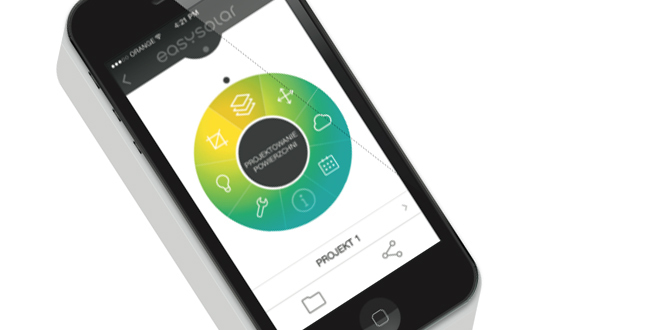 All thanks to EasySolar app, innovative tool to designphotovoltaic plants, pleasant to use thanks to intuitive interface and easy to get on any platform (Android, iOS, WindowsPhone). It is the first software based on cloud technology that will enable sharing projects with chosen professionals and working while being on the go from any device. The app provides all necessary steps necessary for dimensioning and design. Thanks to GPS, camera and Internet present in any smartphone, this can be performed in-situ for any location in the world. Among others, app includes radiation database, shading simulation engine and a base of photovoltaic components as well as cost simulation tool, energy production level and return of investment data in a form of financial analysis. 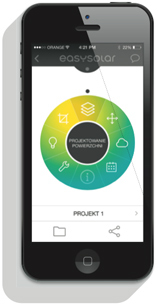 This multi-task app, apart from designing, will be also able to perform professional project documentation for the customer that can be a convincing tool in sales process for installer companies, therefore especially for residential sector.